Roger Brook - the no dig gardener: Where have we been? I thought I would be a bit of a tease and ask you to guess my recent holiday address! Amongst my holiday ambitions was to see terra preta soil and find tropical mistletoe. The first ambition was dashed when I contacted a local terra preta expert. I needed to go south. They looked like mangrove trees just above the normal high tide line. They would certainly have their roots covered by sea water on numerous occasions. Judging by the height up the trunk of what I thought were pneumatophores (breathing structures) it might sometimes be deep. 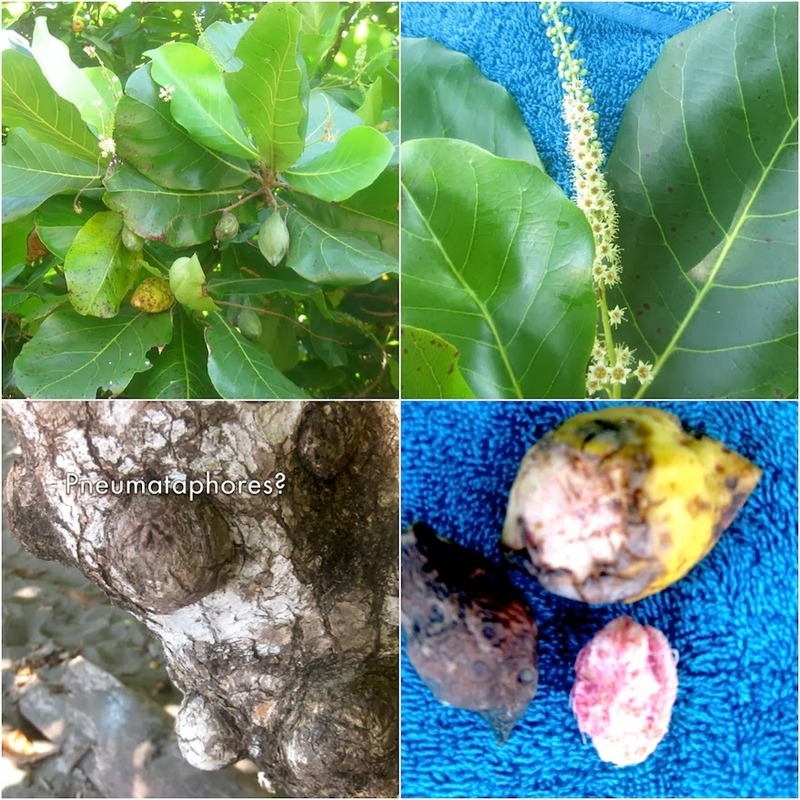 There are seven types of mangrove. I was wrong! We were later to discover in nearby Hacienda Baru wild life rescue park that the majority of the belt of these coastal trees were the tropical almond. This will not tell you my location, the tree thrives across the tropical world and is widely planted. Like the mangrove it can be a first line of defence against coastal erosion. Checking on the net I found it is an example of a tropical dry season deciduous tree. Apparently in one South American town it caused quite a kerfuffle when planted as a street tree to give a European ‘feel’. It caused such a local outcry, they had to be chopped down by governmental decree! Wandering across the burning sands - I needed my sandals - I noticed another sea frontal tree with a petiolate oval leaf. One of these trees carried pinnate prickly leaves as wells the oval ones. I double checked, I had not been drinking, they emerged from the trunk and not from the ground. It must either be some adaptation to ward off grazing predators or was it a hemi- parasite like mistletoe? What is the tree and does it carry a hemi-parasite? I returned to our base in the shade of a tropical almond. On closer inspection some of the trees in the glade had a different kind of growth scrambling high. Was I seeing a tropical mistletoe? I recently blogged about these but have never actually seen one. Unfortunately at this time of year there were no flowers or berries to help me. 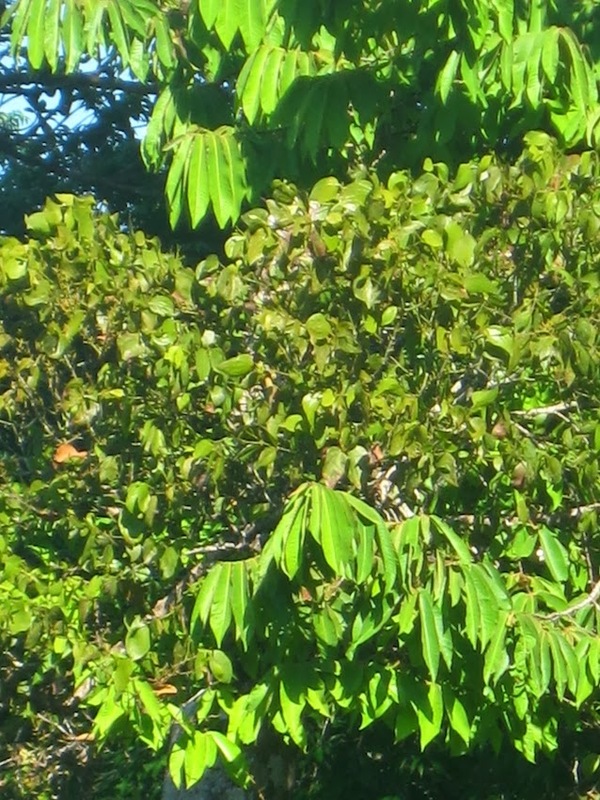 Further research found that Terminalia catappa is a common host to a tropical mistletoe. The parasite was untidy, scruffy and very invasive. We subsequently found it all over the place. Had I achieved my ambition? Is this a tropical mistletoe? Before dropping its deciduous leaves the tropical almond has lovely ‘autumn’ colour. We later found this unwatered unloved specimen showing very premature discolouration prior to losing its leaves. The parasitic growth on this tree really does look like mistletoe! Every time we returned to the beach to soak in the surf I pondered the posited and possibly hypothetical pneumatophores. The trees themselves grew out to the light over the sea and many of the numerous trunks were more horizontal than vertical. Although at this angle they were strongly buttressed against tropical winds their was evidence that some, still attached, had fallen to the ground. Perhaps my possible pneumatophores may just be areas of potential rapid cell division to make new buds and shoots? I saw evidence of such growth. The bark over the rounded humps was easily detached or was even flaking.The revealed circles were girdled with strong callus growth. In one case the intact central tissue was very porous. In many cases it had rotted away to leave quite deep depressions. Ants seemed to thrive in them. One vertical facing hole would have captured a cupful of rain. There are more questions than answers in this post. Hopefully my readers may provide some local knowledge and know-how? Costa Rica? That Isle of Mann pose was a bit scary! Clever Sue, I knew you would get it. Did you google Hascienda Baru? I may have done or it may well be that I am naturally incredibly intelligent! Whatever would make you think that - and look what you have started! Should have shown us some coffee as another clue! Which one is the sloth? Is it the one with its legs in the air? Sue reckons it's a cat from the Isle of Mann! Er, it was you mentioning the Isle of Mann. It's the jet lag! Astute as ever Rick! I will be making my next of four Costa Rica posts tomorrow. We arrived home jet lagged yesterday like I rather disingenuously and prematurely suggested to Sue!